Chrichton's World: Review Late Shift (PC): It's not a game! 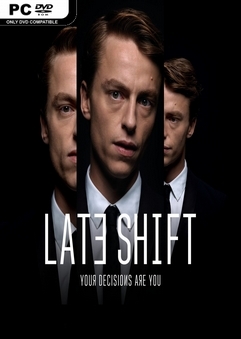 Review Late Shift (PC): It's not a game! When I first was confronted with Full Motion Video (FMV) in video games I was mesmerized. As a big fan of cinema and video games to see both blended into one was like a dream come true. The best of both worlds almost. You have to keep in mind that back in the day I was playing games like King's Quest that looked good but was far removed from the graphics and visuals we are spoiled with today. So to have a piece of cinema displayed on your screen was nothing short of amazing. Even more so since most of the time it was the reward for your interaction with the game. The good games made you work hard but usually made sure you would get treated for your effort. Even if you made mistakes and failed you still would get to see a fabulous death scene reminding you that you have to do better. Imagine King's Quest as a FMV game. Would be quite the undertaking but I can assure you it would be a hit and perhaps cause some controversy since it would be deemed violent and gruesome because that game was relentless and unforgiving. Point is that it would add to the experience. While there have been many good FMV games in the past it did not lead to the next level of cinema some people were hoping. Sometimes it would be real nice to do more than just sitting passively and actually have some input with the outcome on the screen. How many times haven't you yelled at the person on the screen for him or her to look behind or run away? These interactive games made that possible. Some were so exceptional that they created a very unique and extraordinary way of telling the story. Because of your deep involvement you are more invested and more is at stake. Games like these can do what films can't which is the sole reason why adaptations of video games will never work even if those games are very cinematic. You can't adapt or translate that kind of interaction or immersion. That is why I will always cherish these FMV games. So naturally when a game like Late Shift comes along I am intrigued. And as chance would have it I managed to get a free copy of the game for the PC. Before I had even briefly considered buying it on PS4. It was being offered for 4,95 Euro. In hindsight I would have felt cheated if I had. Because even with all the good intentions and high production values Late Shift is not a game. It's barely an interactive movie. There are no puzzles to solve or moments where you actually control your character. All you do is wait for the game to prompt you to make a choice. If you fail to make a choice the game will continue anyway. The game doesn't stop or pause to give you time to think about it. So you have to be very quick and hope your choice or inactivity will lead to a positive result. This kind of interactivity reminds me of the one in Psychic Detective where you had to be real quick. However there is a huge difference between that game and Late Shift. It's length to start with. Psychic Detective is over before you know it. And you are supposed to play it multiple times to see what paths you can or should take. The main story of Late Shift is about an hour. That might not seem that long but if you are supposed to replay it more than once than you can imagine how that could be problematic. Another thing that is different compared to Psychic Detective is the fact that Psychic Detective is original and creative. It gives you a real compelling reason and explanation for why you have to be quick with your decisions. Late Shift has an adequate story but it's hardly interesting. I wasn't expecting real good twist and turns but a little more spectacle or something more crude and outrageous would have been nice. Not one of the initial choices I made lead to death or the game ending prematurely. Not once did it feel something was at stake. Sure as the decent human being I am I did not want bad things to happen. But I suspect that if I had, the story still would play out similar with only minor differences. For me the game ended badly and yet I have no desire to play the game again. The game did not even entice me to although it did give me a summary at the end of the number of decisions and how many chapters you unlocked. But not once did it ask me or taunt me to do play it again? Even if I could skip scenes I am pretty sure that there isn't that much to the story. But let's assume that the story does have some surprises I can't see myself replaying the game and choosing differently since I don't really care. I would have, had the choices more impact or had I more to do. The lack of interaction is what really killed the game for me. There was a time I thought that some games went overboard with some of their puzzles. But believe it or not now even those annoying and illogical ones give you a sense of accomplishment. Late Shift never ever gives you this sense. Next to pleasure I do expect games to challenge me in some way and there is none to be found here. I don't see how people can overlook this big flaw so easily. Another game comes to mind called Tender Loving Care. It's a psychological thriller and that one also plays out more like a movie than a game. However at important parts it does ask for your input where you are required to take certain action and answer questions. These questions directly change the outcome of the following events plus they force you to put some thought about the subject discussed or what is going on in the game. On top of it the game (or rather late John Hurt who plays a psychiatrist) involves you into this particular case by asking for your perspective and take on it. Immediately you are invested and you want to know more. While the level of interactivity was far from ideal it asked more of you than Late Shift does. You aren't even given time to let certain actions sink in. Real people put in dire situations might act more on impulse but take it from someone like me who is very impulsive you still will stop and think about your actions and it's consequences. The game never allows you. Also the game doesn't do a good job of telling you what the main character is about. We know next to nothing about him. I am supposed to identify with someone I barely know? It takes time to establish a connection if you want to make it believable. I hope Late Shift indeed will lead to more popularity concerning the genre and will bring us more of these games. Although I do hope that those games won't follow Late Shift's path and will be more interactive and interesting. As it is now, it's not worth your time. Check out my list of the best FMV adventure games I have played.